While the Republican party is doing everything in its power to rig the 2012 election and make sure that potential Democrats are not able to vote, the Democratic National Committee and the Obama Campaign are fighting back by introducing a new open source web app that lets unregistered Americans register to vote online. The app lets potential voters fill out a National Voter Registration Form on the web, which is then converted into a PDF that can be printed and submitted — and to make things a little easier the app also includes all of the necessary registration guidelines and information for each individual state. So if you live in a state that supports online registration you can forgo the PDF all together, as the app will direct you to the appropriate online form. Adam Fetcher, a Obama campaign spokesman, says the tools are intended to simplify the process of registering for all citizens in order to make elections more representative. 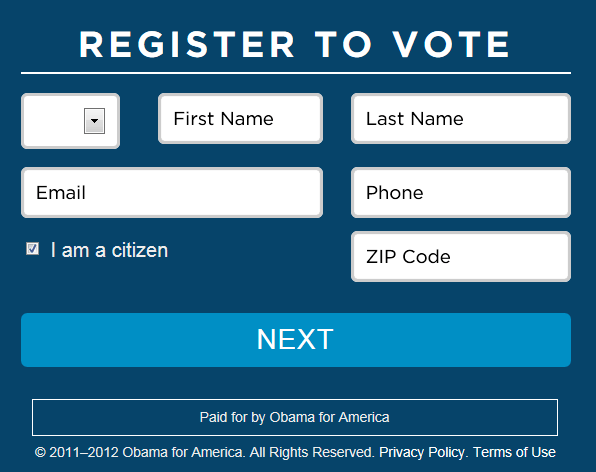 The Democratic National Committee app code is released under a custom license from the DNC that allows wide re-use of the code and the Obama re-election campaign debuted its own version, a point-and-click customizable voter registration form that anyone can embed on their website or in a blog post. According to estimates from George Madison University, in 2010 there approximately 217 million eligible voters in the United States but only 41 percent of them turned out to vote. Use these codes and pass them on and let’s make sure that everyone who is an eligible Democrat and Progressive voter registers and gets out to vote in November. Our very lives do depend on it. *Back2Stonewall.com wilol be adding the Online Voter Registration App shortly and we hope that all websites and blogs will do the same.